Which is more important in B2B social media, social or media? For way too many B2B marketers, the answer is media. In the B2B marketing community, content marketing has eclipsed blogging, engagement is measured in click-throughs, and gamification is sexier than conversation. Too many B2B professionals see social media as just another marketing communication channel. It is not! This is the third post in a series designed to help B2B professionals create better social business strategies by thinking in terms of B2B social networking over B2B social media. This post builds on the concepts introduced in the previous installment on professional social networking using B2B social media to explore the opportunities for social business at the company and industry levels. You won’t find tips and tricks for LinkedIn, Twitter or Facebook here, because the foundations of social business transcend the tools. I promise that later posts in the series will get to the tips and tricks, but social business is first and foremost about people, not technology. Unlike a B2C brand, revenue at a B2B business is driven by the firm’s underlying professional network, because the social business network of B2B professionals includes their customers. By definition, every B2B business is selling to other businesses, as opposed to a consumer. As such, the professional ties between company and customer are very strong. They go far beyond brand image and brand loyalty to include serious business goals, significant professional relationships and personal career success. Moreover, the professional ties between B2B customers can also be very strong, creating an ecosystem that extends beyond the company to include the entire industry. While having a strong industry network is also important for B2C professionals, that network generally excludes their customers for all but the highest end luxury or durable goods, such as yachts and real estate. Not so in B2B. Successful B2B professionals are connected, and those connections include their customers. A B2B business has only one social business network, company and customer, offline and online. This singular fact should always remain top of mind when crafting a B2B social business strategy. While B2C marketers must struggle for brand engagement and must avoid unnatural intrusion by their brands into the personal social networks of consumers, B2B marketers, sales reps, service agents, executives and potentially all employees in a B2B social business are an integral part of their customers’ industry network and should seek to expand and strengthen that network through B2B social media. Imagine for a minute that everyone in your industry is on LinkedIn, and everyone is linked to everyone else they know in the industry (this is what LinkedIn imagines ). Now imagine a map of that network with all your company’s employees at the center and your company’s customers on the next circle out, then your company’s prospects and partners, and finally your industry’s consultants, analysts, press, competitors, associations and so forth to create the complete social network of your industry’s ecosystem. 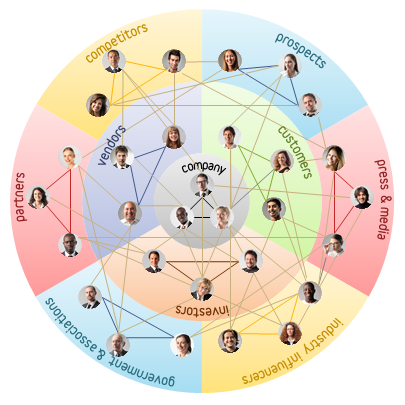 That is your company’s B2B social business network. The B2B social business network extends out from the company to include every professional in the industry ecosystem. Most importantly, a B2B company’s social business network includes its customers, because unlike consumers, B2B professionals are there to do business. Unfortunately, your company’s social business network is not all on LinkedIn, but it could be. It could be on Twitter. It could be commenting on your forum and your blog. When you clearly imagine your company’s social business network and beyond that to your entire industry’s social business network, the full potential of B2B social media to drive B2B social networking unfolds before you. B2B social media is a tool that automates and accelerates B2B social networking, it is not simply a marketing platform. There is a reason why LinkedIn is profitable largely through paid subscriptions, while Facebook struggles to monetize through ads. Unlike consumers, businesses are willing to pay for the value of B2B social networking. Advertising is just gravy for LinkedIn. Social media connects and energizes the B2B social business network, but it is still only a tool. It is not the network. The B2B social business network is composed of real people with real relationships that drive business throughout an industry. In the first post in this series, I proposed that the fundamental purpose of B2B social media is to increase the frequency, velocity, and quality of business referrals, a referral being broadly defined as a trusted relationship and the sharing of some useful information that facilitates a business opportunity. The second post went on to claim that reciprocity is the cornerstone of good professional networking. Just being helpful builds trust and transforms weak ties into strong ties. So let’s put aside the content strategy, engagement, gamification, and other buzzwords for a moment and talk about the right way to use B2B social media: as a technology enabler of B2B networking. Here is the B2B social business bill of rights. Don’t get it wrong! The first goal of any B2B social business program should be to get every target prospect, customer, and influencer connected to the relevant sales, service, marketing, executive, and other employees within your company. In short, expand the company network, online and offline. If your industry is not very active in B2B social media, then your social business programs should encourage it. Start a LinkedIn Group and invite others to join. Write a blog and encourage comments. Help your offline social business network link up online. Getting your offline social business network online, linked, liked, followed, and subscribed is the foundation of success for all your B2B social media programs. Being helpful builds community within your social business network, because it is reciprocity that enables information to flow and strengthens bonds within your social business network. You may produce killer content for every buyer persona at every stage of the buying process, but when prospects are not ready to buy right now, it is reciprocity that keeps them from opting out of your nurturing queue. You must offer helpful information to keep them coming back for more. Helpful can mean many things to many people within your social business network: opportunity, education, support, entertainment, unique, simple, and so forth. What is helpful to your customers is different from what is helpful to your prospects, your partners and your industry influencers. Whatever helpful means in your industry, it is essential to energizing your social business network, driving referrals, and enabling viral word-of-mouth, because at the center of every viral social media program is a helpful gem of information. If you’ve done a good job of building community within your social business network and you’re offering lots of helpful information, then the next link in the B2B social media chain is to facilitate and accelerate the sharing of that helpful information throughout your social business network. Getting your content shared online is the B2B social media equivalent of word-of-mouth marketing. Word-of-mouth marketing is not only the most effective marketing communication channel; it is also the cheapest. Consistent sharing calls-to-action should be available for all your content. Beyond this, sharing helpful information from other sources builds reciprocity and sets an example for other members of your social business network. For example, content curation may already be a part of your B2B social media strategy, but do you see it as a way to fill in content gaps or a way to build relationships with the authors who create it and a way to encourage them to share your content in return. Lastly, sharing helpful information isn’t just about content. It’s about communication between real people. It’s about opportunity. Your B2B social media strategy should go beyond simple content sharing to driving business referrals throughout your social business network. The be-all, end-all accomplishment of B2B marketing is a customer referral. When your customers consistently tell their colleagues that they should buy from you, it’s time for vacation, because you’ve earned it, and demand for your products will continue without you. Your B2B social media strategy should definitely encourage customer referrals. However, why not take it one step further and promote referrals throughout your social business network? That’s all fine and good Joel, you say, but my company is in the business of making money. How are we going to make money by altruistically driving referrals? Within that circle of your social business network that represents your firm, everyone is aligned behind the same business goals (hopefully). Once you cross the line into areas of your social business network occupied by your customers, prospects, partners and the like, your goals are no longer aligned. The practice of driving referrals through your social business network forces you to align your goals with their goals. Do your case studies help your customers as much as they help you? Do your partnerships with industry experts promote their services as strongly as your own? Do you create opportunities within your social business network, or do you just sell to it? In B2B social media, what goes around online comes around online, and offline. If you want customers, partners and industry influencers supporting your business, then you have to give something in return. Driving referrals builds reciprocity, and reciprocity turns weak ties into strong ones. B2B marketers would call this right the “influencer marketing” right or “customer reference” right. I frequently use these terms myself. The problem is that these selfish words obscure the means to their own end. They’re all about us. Do we really want to market to the influencer, so the influencer can influence our prospects? Or, do we want to expand our social business network by providing useful information, referrals and business opportunities to our industry influencers in order to build a relationship founded on reciprocity? Every good salesperson knows that asking a customer for a referral is the last thing you do, not the first, because it is the trust and early deposits in the reciprocity bank that make it possible. Some products and services are so emotionally charged that they engender advocates just by doing what they do. These are usually consumer products, because we as consumers sometimes define ourselves by the products we buy and use. They say something about who we are. B2B customers define themselves by their company and industry relationships. B2B brand loyalties are a function of the B2B social business network as much as the product. B2B social media can help turn prospects into customers and turn customers into champions, but not by running an ad on Facebook. B2B social media turns weak ties into strong ties and customers into advocates by energizing the B2B social business network. In the articles to come, I’ll provide well grounded social business tactics for specific B2B marketing programs based on the B2B Social Business Bill of Rights presented here, including the following. Taking the social networking-centric view, these posts will explore specific ways to improve your B2B social business strategies and tactics. Please stay tuned!